I just love a good indoor plant! They help add color, texture and life into a space and I just can’t get enough of them. (Literally – I need more. Now.) I always heard that if you were starting out with plants, you should start with succulents because they’re hard to kill. I’m not sure if that’s completely accurate, but we’ll get to the care part of succulents in a bit. 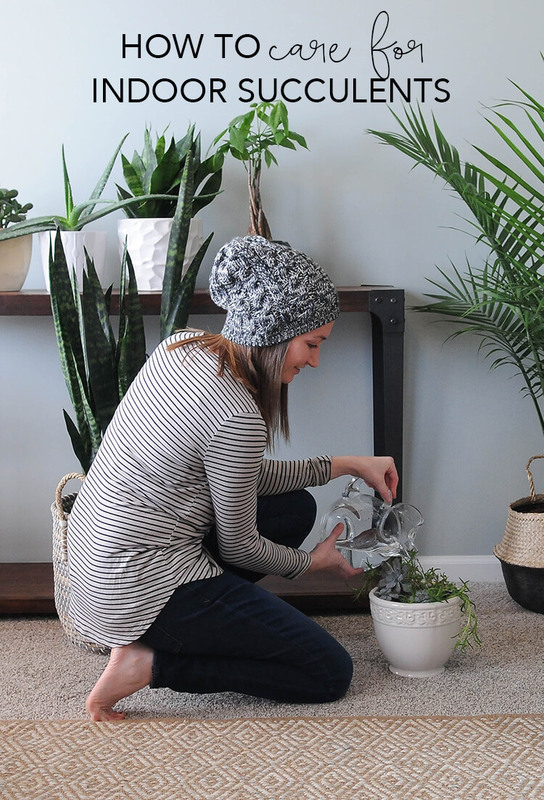 First I’d like to show you how to plant indoor succulents. I use affiliate links in this post to share my favorite products. It’s obviously not rocket science. It’s actually a lot like planting any other plant inside. 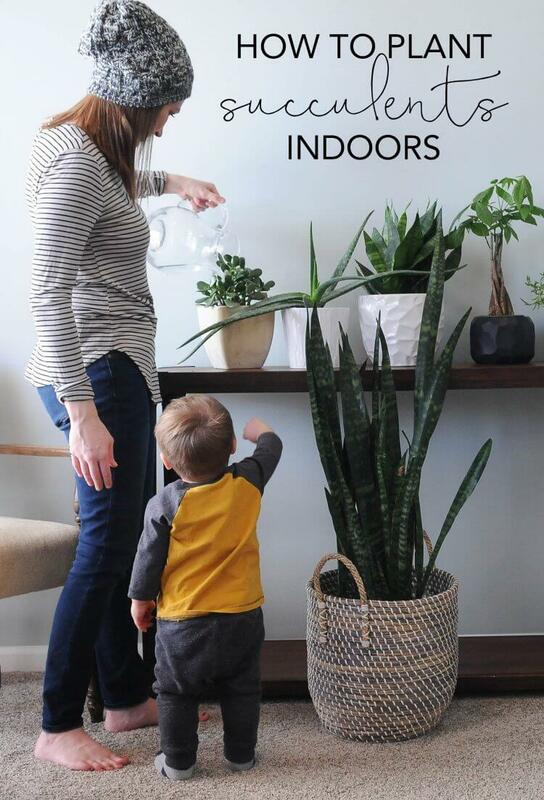 But you might have found this article if you’ve killed a few of the “easiest plants to keep alive” and are wondering what you’re doing wrong. Hand raised. I definitely killed 4 or 5 succulents in the beginning. So there’s a couple things going on here. One of my favorite succulents that’s super is to take are of is jade. If you’re having trouble keeping one alive, start with jade to build your confidence, then move on to other types of succulents. Most succulents are planted in fairly small containers until they grow enough to be moved to something bigger. First – you need a to plan for some sort of drainage in your pot. You can either buy a pot that has a tray for drainage, or you can put rocks in the bottom of your pot with no drainage. As for rocks, just gather some from outside, they’ll work just fine! If you don’t have access to rocks, these will work too. Fill the bottom inch or so of your planter. Insert your plant and add a little more soil around the plant, then lighting pack it down and you’re done. The most important part of raising succulents indoor happens AFTER the planting. In my experience, plants need WAY more sunlight than what we’re led to believe. Sunlight decreases dramatically every foot from the window, so even if you think your plant is getting enough light, it might not be. Succulents are desert plants and can handle full light. So use them to decorate as close to windows as possible! As far as watering goes, the key is not to overwater. I water around the 1st and 15th of the month and try not to mess with them until then. Your instinct is to give them more water if they’re looking sad, but that can actually kill them faster. If you feel like they need a boost, wait the full two weeks to water them, and add some succulent plant food. With drainage, plenty of sunlight and the right amount of water, you’re succulents will be flourishing in no time. After you have success with one, you’ll be itching to fill your home with them! 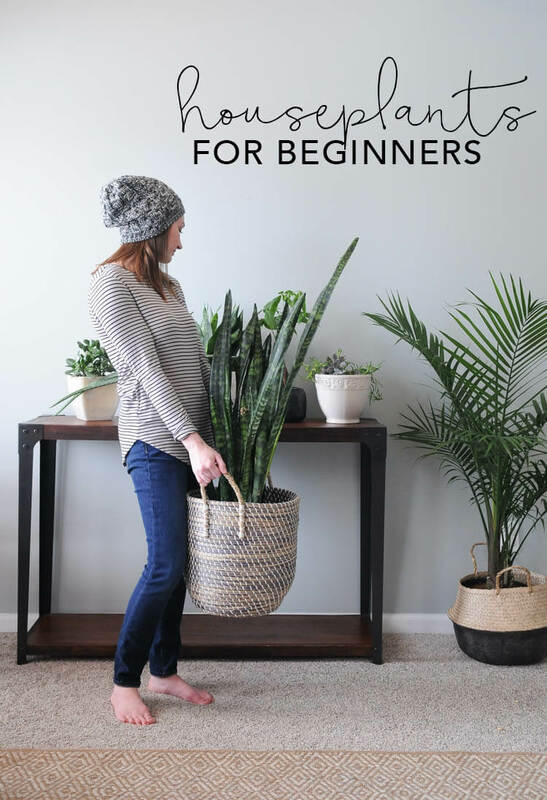 If you liked this post about how to plant indoor succulents, you might also like my more complete guide to taking care of plants, houseplants for beginners guide. I have one succulent plant in my office. It is thriving and growing. It was very small when I bought it, but has grown about 4 to 5 inches wider. It’s in a bright room with a great temperature. I give it plant food as directed and water it when it gets dry about half an inch of top soil. It use to have little purple flowers when I first got it, but haven’t seen any since. I want to see them again, which is my goal! I will be buying another succulent very soon! Thanks for the advice! It’s so rewarding to watch them grow isn’t it?? I’m glad you’re having such good luck with yours!